Cyrus J. Willis had to negotiate with the Redlands City Council in 1928 before building his home. The Planning Commission had only existed for four years and no city master plan had ever been adopted. The issue was whether Myrtle Street would continue to East Cypress Avenue or end at East Fern. 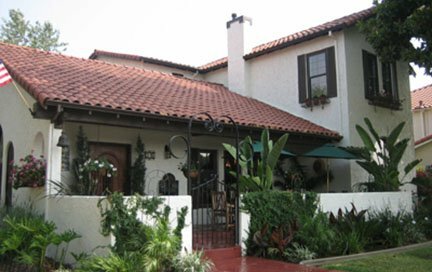 Willis won the decision with a split City Council vote that allowed his home to receive a building permit for $16.00 and a two-story, stucco exterior, Spanish style residence was constructed. The $7,500 price tag was not uncommon for the time period and also paid for the lot. Two short stories appeared in the Redlands Daily Facts. R. E. Raine was the building contractor. The Spanish Revival home is crowned with a red-tile roof and crenulations decorating the fire place. The exterior jazz plastering is apparent along with eaves that feature protruding rafters, iron work around the windows, a west side balcony and a beautiful semi-circular front window. The garden wall was built later in 1950. Cyrus Willis came to Redlands in 1904 and by 1933 was the field man for the Crafton Orange Growers Association. His involvement with citrus was life long both as a grower, packing house field man and marketing jobber. His first home was at 1633 East Citrus Avenue, where his twenty acre grove was located. He remained in his Fern Avenue home until just before he died in June 1959 after living in Redlands 55 years. Another noteworthy owner, who did extensive work on the home, was John Overton Pratt, a University of Redlands tennis star. In 1985 he was inducted into the U of R Athletic Hall of Fame. Pratt Brothers Sporting Goods opened their doors on East State Street in 1935 and was a business fixture on the corner of Church and Citrus Avenue for decades. This residence would be easy walking distance from the store. Pratt died at the age of 85 in 1997. Pratt remodeled the kitchen in 1958 and also updated the electrical and plumbing throughout the home. The roof received attention in 1963 with a permit noting that the previous roof work was by Willis in 1946. Don Yahnke completed a spa in 1978. Since Overton Pratt sold the home in the 1970’s eight different owners have been listed. With apartments springing up all around them City Hall finally won out and allowed a driveway to the adjoining apartments behind the home. John and Anna Khristina Hermanson deserve credit for keeping this 2006 Heritage Home in fine shape. Thus the Redlands Area Historical Society is pleased to bestow this award on such a lovely home.